For the Nintendo DS game, see Diddy Kong Racing DS. 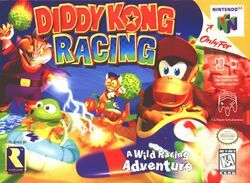 Diddy Kong Racing is a kart racing game for the Nintendo 64; released in 1997 it became the fastest selling video game of all time, selling 800,000 copies in two weeks. The game is Rareware's take on the ever popular kart racing genre, popularised by Super Mario Kart on the SNES, and includes a number of Rare's signature characters. What sets it apart from the traditional kart racer is its adventure mode, where players drive, hover or fly through a series of worlds, unlocking subsequent courses as they complete those prior. The game features twenty racing tracks, four battle arenas and a number of boss challenges whereby the player must beat a single island denizen in a one-on-one race. Diddy Kong Racing begins with an evil, space-faring pig named Wizpig invading the peaceful Timber's island where the game's main characters reside. In order to defeat Wizpig the allied heroes must complete a series of races in the island's varied domains, each one culminating in a challenge from the area's boss. Timber Island's greatest racer, Drumstick, challenged Wizpig and failed, being transformed into a frog as punishment and leaving the island's fate to those less suited. This page was last edited on 8 May 2015, at 22:09.